A recent grant from the National Science Foundation (NSF) to create a year-round aquatic optical analysis laboratory at Lacawac Sanctuary in Pennsylvania – one of the field sites of Miami University's Center for Aquatic and Watershed Sciences (CAWS) - will enhance Lacawac's role as a resource for research and training for national and global ecological observatory networks. The new lab will contribute to the innovative optical sensor research at Lake Lacawac conducted by Craig Williamson, Ohio Eminent Scholar of Ecosystem Ecology and professor of biology at Miami, and other researchers from Miami and from more than 27 other institutions around the country. "This lab will greatly augment the opportunities for Miami students and faculty to carry out independent research on natural glacial lakes in a location that is a 'hub for EONs – ecological observatory networks," said Lesley Knoll (Miami Ph.D. '11), principal investigator of the more than $329,000 grant. Knoll is director of research and education at Lacawac Sanctuary and a staff member of the department of biology at Miami. Analytical laboratory space and optical instruments provided by grant funds will allow Knoll, Williamson and other scientists to train students and faculty on emerging sensors, sensor deployment platforms such as buoys and other EON approaches. Lacawac Sanctuary is a 550-acre nature preserve located in the Pocono Mountains in northeastern Pennsylvania. The independent nonprofit sanctuary is home to an ecological field research station and environmental education facility. The sanctuary supports diverse aquatic and terrestrial habitats including the 52-acre glacial lake, Lake Lacawac - a National Natural Landmark. Nearly the entire watershed of Lake Lacawac is owned and protected by the sanctuary. "Such a well-protected lake that is relatively unimpacted by humans provides rare 'hands-on' learning and long-term research opportunities," Williamson said. In addition to Miami researchers, over the past five years scientists from more than 27 other institutions nationwide and from Russia have conducted research at Lacawac. Lacawac Sanctuary also hosts field trips for nearly 20 institutions in the Pennsylvania-Connecticut region. "We view lakes as sentinels or indicators of environmental change with an emphasis on deciphering the most valuable sentinels of climate change," Williamson said. With the help of sensors, "we hope to better understand how changes in the watershed and climate affect variables such as lake transparency, dissolved organic carbon (DOC) and chlorophyll. With these data, we can track how lakes change seasonally and over the long term." Williamson has been conducting research with Miami undergraduate and graduate students at Lacawac Sanctuary for the past eight years. Nine graduate students and nine undergraduate students - including several undergraduate summer scholars and Miami-Hughes Intern award winners - have spent summers involved in research at Lake Lacawac. 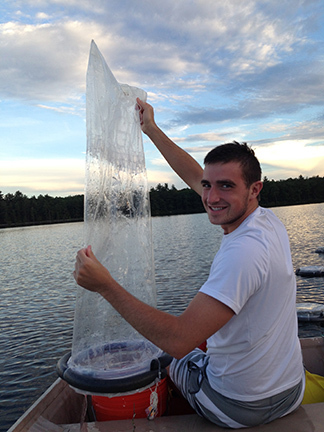 More than a dozen undergraduate students have worked on Lacawac data and samples or developed research projects from the long-term Pocono lake dataset. An additional 10 Miami graduate students have visited Lacawac for training workshops or research, and seven Miami faculty members have been involved at Lacawac over the past few years, according to Williamson. Through active research programs, training workshops and websites facilitated by Lacawac, hundreds of students and faculty are reached each year, Knoll said. The grant will also enable the continuation of the annual Lacawac Ecological Observatory Workshop, the Lacawac Ecology Conference and summer internship opportunities for undergraduates and graduate students. The new lab will provide exceptional opportunities for Miami students through CAWS and the Institute for the Environment and Sustainability (IES), said Knoll. The lab will also allow Knoll to partner with regional K-12 schools and environmental organizations for outreach and STEM educational/research opportunities. 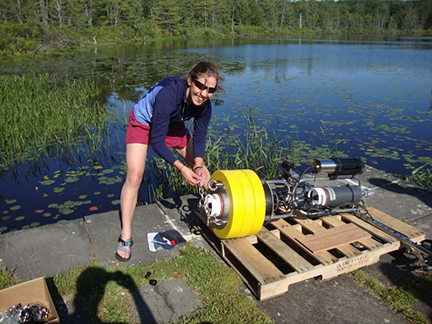 Williamson’s lab has collected a valuable, long-term, 25-year dataset on Pocono-region lakes. The dataset is being used to answer questions related to climate change, UV radiation and atmospheric pollutants. 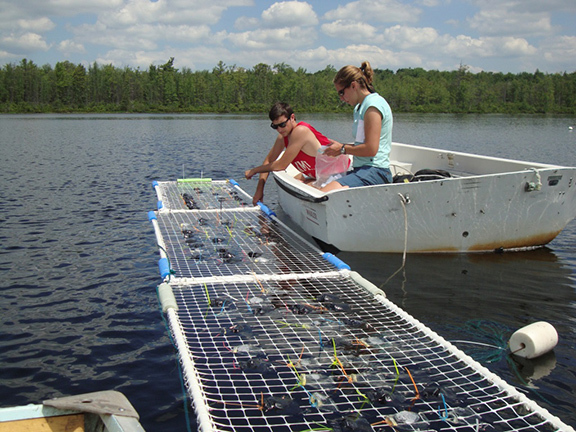 Lacawac has a long history of supporting research on ultraviolet radiation impacts to lake communities and ecosystems and on the development of novel aquatic optical metrics. It's also a site for testing emerging sensors, sensor platforms and sensor techniques, according to Williamson. Lake Lacawac became a site member of the Global Lake Ecological Observatory Network (GLEON) in 2012, joining a network of 43 GLEON research sites located in 17 countries plus Antartica. "The new laboratory facility will be another great resource for GLEON members seeking research and training opportunities related to advanced aquatic sensors and ecological observatory network science," said Kathleen Weathers, co-chair of GLEON and a senior scientist at the Cary Institute of Ecosystem Studies. Miami University also is a member of the National Ecological Observatory Network (NEON) – a continental-scale observatory that measures the causes and effects of climate change, land use change and invasive species on U.S. ecosystems. The co-principal investigators on the NSF grant with Knoll are Williamson; Robert Sanders, Temple University; Bruce Hargreaves, Lehigh University; and Janet Fischer, Franklin and Marshall College. Written by Susan Meikle, university news and communications, meiklesb@MiamiOH.edu.